Robert Luff & Co are proud to present this quite superb waterfront home located backing directly onto Widewater lagoon nature reserve. The property is arranged over three storeys and comprises a magnificent FOUR BEDROOM home with beautiful decked garden accessing the lagoon and far reaching coastal views over Brighton to the seven sisters in the east. There is also a TWO BEDROOM GROUND FLOOR APARTMENT with outside space available to purchase for an ADDITIONAL £220,000, which purchased together, would be fantastic for multi-generational living or home and income. This property must be viewed to be fully appreciated. Stairs leading up to first floor, double glazed window to side aspect, stairs leading to top floor landing and storage space. Low level flush WC, wall mounted wash hand basin, cupboard housing boiler and half tiled walls. Double glazed doors to rear aspect giving panoramic views over Widewater to the beach and out to sea, radiator, feature fireplace with gas fire, TV point and coved ceiling. Leading from the living room, wood flooring, coved ceiling and again stunning views over Widewater and out to sea. Double glazed box bay window to front aspect with views over the downs, double glazed window to side providing double aspect, coved ceiling, wall lights and radiator. 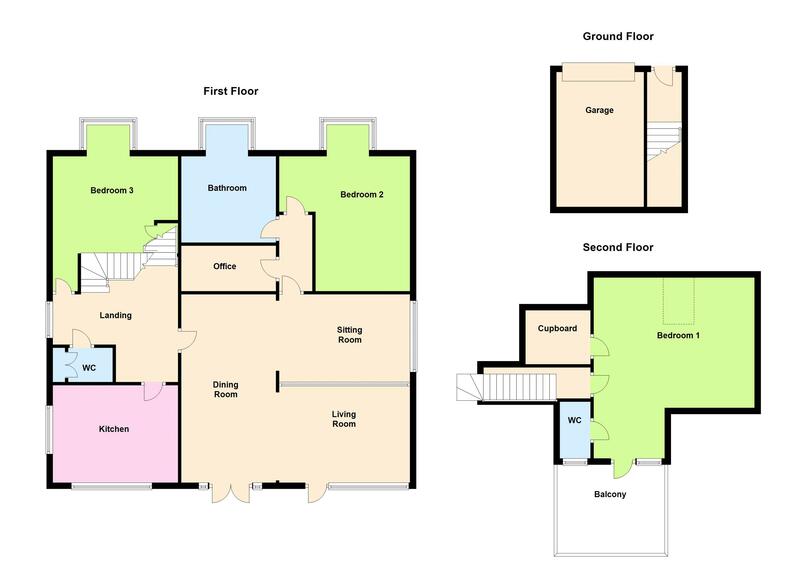 Panel enclosed bath with mixer tap and shower attachment, separate walk in shower enclosure, vanity wash hand basin with cupboard under and WC, ladder radiator, part wood panel walls, tiled floor, box double glazed bay window to front aspect and extractor fan. Stained glass inner window and coved ceiling. Double glazed box bay window, radiator, built in wardrobe and coved ceiling. Double glazed windows to rear aspect with views over Widewater, double glazed window to side, range of fitted white high gloss wall and base units, white work surfaces incorporating a ceramic one and a half bowl sink unit with mixer tap and drainer, tiled splash backs, radiator, 'Smeg' range cooker and matching 'Smeg' extractor hood over, space and plumbing for appliances, space for fridge/freezer, integrated dishwasher and downlights. Radiator, double glazed french doors leading out to the deck providing views over 'Widewater' and out to sea, TV point, dressing room and double glazed velux window to front aspect. Rail enclosed views over 'Widewater', beach huts, out to sea, along Brighton and to Seven Sisters in the East. Walk in shower enclosure, wash hand basin, low level flush WC, part tiled walls, extractor fan and double glazed window to rear with again beautiful views over Widewater and out to sea. Two electrically operated remote control awnings, white painted decking, solar lights, shingle, palm trees, boat themed raised deck with flag pole, outside power and light, flower beds, summer house with windows and glazed doors, shed, side access and under house storage. Electric remote operated up and over door with power and light.